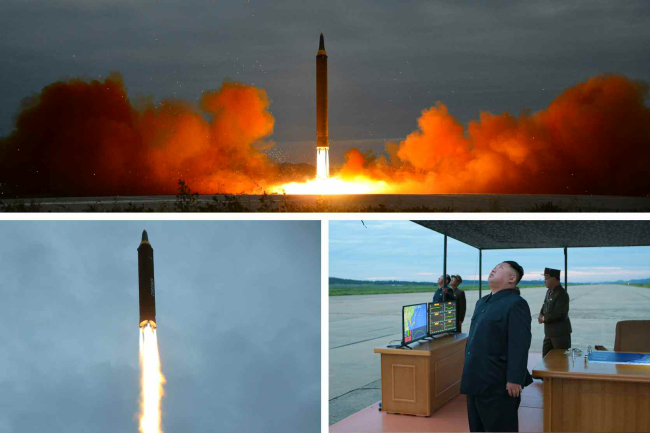 North Korea on Wednesday confirmed it employed the Hwasong-12 intermediate-range ballistic missile in its test a day earlier, threatening to launch even more weapons targeting the Pacific. Leader Kim Jong-un oversaw the latest test, expressing “great satisfaction,” state media said. He called the launch the “first step” in the North Korean military’s operation in the Pacific and a “meaningful prelude” to containing Guam, which it recently threatened to strike. “It is necessary to positively push forward the work for putting the strategic force on a modern basis by conducting more ballistic rocket launching drills with the Pacific as a target in the future,” Kim was quoted as saying by the North’s official Korean Central News Agency. After taking off from the capital Pyongyang’s Sunan airfield, the projectile flew some 2,700 kilometers and reached a maximum altitude of 550 kilometers before falling into the northern Pacific Ocean after crossing the northern Japanese island of Hokkaido, according to Seoul’s Joint Chiefs of Staff. The choice of the Hwasong-12 was seen as a demonstration of the Kim Jong-un regime’s resolve that it is capable of realizing its threats to create “enveloping fire” around Guam, some 3,300 kilometers away. Experts estimate the missile’s maximum range to be about 4,500-5,000 kilometers. The launch was part of the North’s “muscle-flexing” against an ongoing South Korea-US military drill named Ulchi Freedom Guardian, which Pyongyang has derided as a rehearsal for invasion. “I think the launch was primarily intended to test the ballistic missile technology, but given the possibility of US retaliation if it’s fired toward Guam, the missile should inevitably have passed over Japan to travel 2,700 kilometers,” said Lee Dae-woo, a researcher at the Sejong Institute. The latest provocation dimmed the prospects of a recent series of dialogue offers from Seoul and Washington following a flare-up in tension and rhetoric since Pyongyang’s intercontinental ballistic missiles tests earlier this month and ensuing Guam threats. South Korean Foreign Minister Kang Kyung-wha said Monday there would likely be “room for diplomacy” for denuclearization talks if the North refrains from additional provocations such as until the Oct. 4 anniversary of a watershed inter-Korean declaration and the Oct. 10 anniversary of the founding of its ruling Workers’ Party. However, Tuesday’s launch indicated such a possibility remains dim. Seoul’s National Intelligence Service also said Monday the North appears ready for an additional nuclear test at its Punggye complex. The UN Security Council convened an emergency meeting Tuesday, strongly condemning the experiment as “outrageous” and calling for “immediate, concrete actions” to defuse tension. “Threatening and destabilizing actions only increase the North Korean regime’s isolation in the region and among all nations of the world. All options are on the table,” he said in a statement. While criticizing the provocation, Chinese Foreign Minister Wang Yi called for a restart of talks, including a stalled six-nation denuclearization forum involving the US, China, Russia, Japan and the two Koreas.